So this is the first post of what I hope to be an interesting journey (for me and you reading along!) as I leave the comforts of my corner office in the corporate world and embark on becoming a high school teacher. It’s been four months since I traded my high heels for ‘sensible’ flats and stepped into the pressure cooker that is ‘Teachers College’. Reflection. A word and activity that has become a staple in the diet of pedagogies that we digest at rapid rates, so much so that I have started to reflect on, well, everything. Over the past couple of days I began reflecting on my career to date, how did I get to where I am? Apart from giving me the start of a headache what this has made me realise is that what had prepared me for life’s challenges so far was creativity – and I’m not just meaning traditional paint to paper creativity. I mean the ability to thinking creatively: problem solve, critically observe and use creative communication devices. 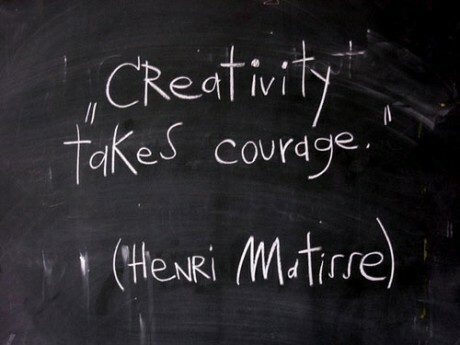 It’s made me think that maybe this is my challenge – how to foster creativity in my classroom? I am yet to take over my own classroom however being a student teacher for the last four months has allowed me wide open access to various classrooms across two very different schools in Auckland. I have witnessed some amazing teachers sparking passion in their students like wildfire but that being said I have also seen some whose own light is only just flickering. I now wonder, how do I ensure I keep my own flame ignited while battling paperwork, classroom behaviour issues while the clock counts down every hour? I think perhaps the answer is the same – creativity. Maybe creativity is like energy. It is never used up and just flows from one to another. Creativity is key! You can’t teach the same thing the same way year after year because the boredom and lack of inspiration sets in. You are going to be an awesome teacher because you understand that ‘creativity is like energy’. A great phrase! Holiday breaks are really important to rest and recharge otherwise the creative flame burns low.